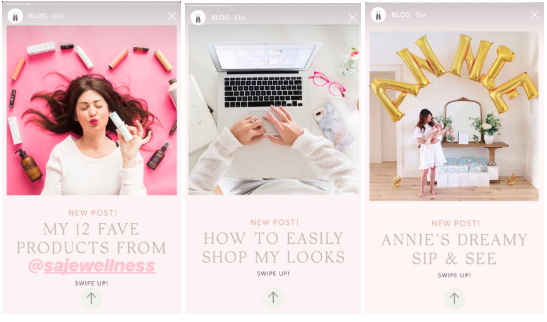 If you’re looking to create clean, polished, and consistently stylish Instagram Stories for your brand, Instagram Stories templates are the way to go. Most of your favorite brands probably already use them. And with 500 million users watching Instagram Stories daily, it’s never been more important to make sure your disappearing content stands out from the crowd. 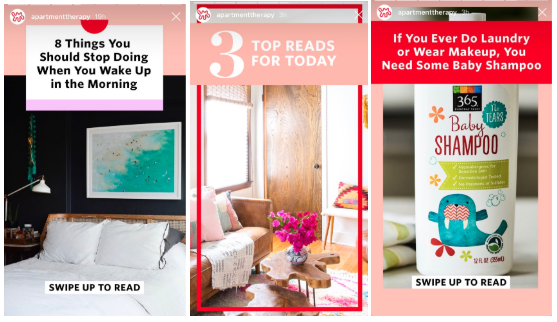 In this post, we’ll show you how to use Instagram Stories templates to wow your audience and showcase your best content. We’ve also included a designer pack of 20 customizable templates that will boost the look of your Stories right away. 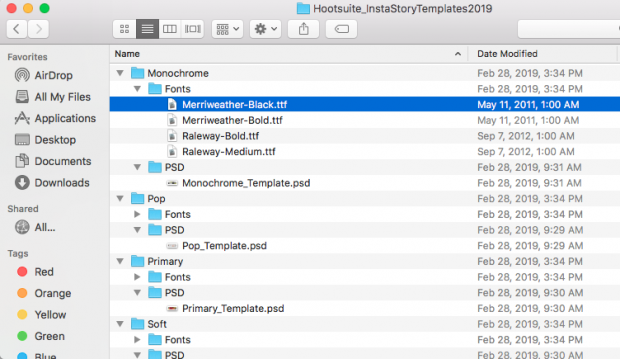 Why use Instagram Stories templates? As Stories become more popular, brands and influencers are attempting to keep up with higher demands for disappearing content. Plus, now you can turn Stories into “Highlights” on your Instagram profile. That means a lot of “disappearing” content is much less likely to disappear. Might as well make it look nice, right? But there are tons of other reasons to use Instagram Stories templates, too. Yes, Instagram Stories is primarily known for its unpolished look and feel (anyone else weirdly addicted to watching Busy Phillips sweat through her daily workout?). But, as with all social networks, the level of curation that users expect from brands is steadily rising. Luckily you don’t have to choose between one strategy or the other. Blogger Jillian Harris typically shares unedited behind-the-scenes content of her daily life on Instagram Stories. But whenever she shares a new blog post with followers, she uses a template. The template uses colors and fonts that are similar to her website. When users “swipe up,” they are brought to a web page with a consistent look and feel, enabling a smooth navigation experience. And that’s how you know she’s a pro. Because most content on Stories disappears after 24 hours (unless you post them to your Highlights), it doesn’t make sense to professionally design every single shot or video. But if you know you’re going to be regularly posting certain types of content, designing a template to accompany each one will save you time (and the cost of hiring a pro) in the future. Style blogger Lee Vosburgh uses different templates for different types of blog posts. She also uses a different template for her Instagram Stories fashion tutorials. Pro tip: Instagram’s API does not yet allow for advanced scheduling of Instagram Stories. But it never hurts to use templates to plan and create your Stories ahead of time. Then you can upload them whenever you want. Instagram is a visual platform where brands that invest in good photography excel. 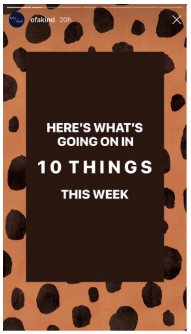 But not everyone on Instagram is selling something visually exciting like three-story rainforest cabins or the perfect color-blocked leggings. 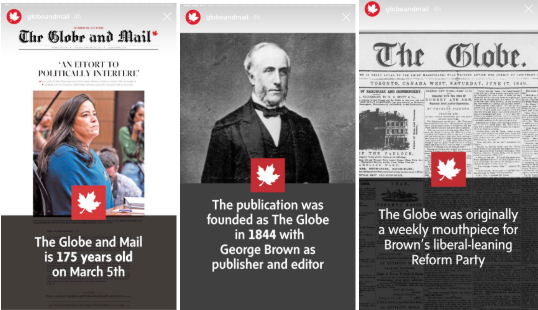 The Globe and Mail, Canada’s national newspaper, gets people to swipe up on their news stories by using a template that makes their content pop. Even though it’s less flashy than glitter eyeshadow, it catches the eye in a Stories feed full of bright visuals. Or, maybe you just need to post a Story that doesn’t necessarily call for a photograph, such as online lifestyle shop Of a Kind. This one’s easy. Instagram Stories templates are a quick and simple way for your brand to stand out in a sea of disappearing content. They give you a chance to show you’re ahead of the curve on Instagram, showcase your brand’s style, and tell your readers you’ve put time and thought into your content. Interior design publication Apartment Therapy has always been great at Instagram. This is partially because their subject is beautiful homes that look great on Instagram, but also because—as a brand—they’re usually quick to try new Instagram trends. Unsurprisingly, Apartment Therapy was one of the first big Instagram accounts to start using Instagram Stories templates. 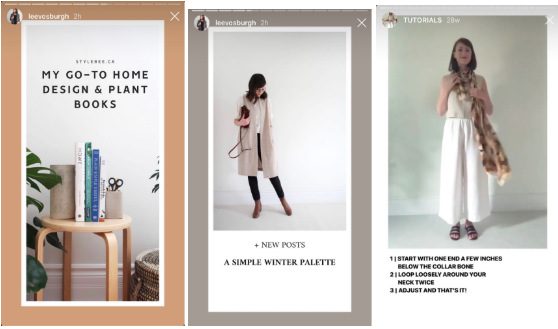 Apartment Therapy uses several different templates within a recognizable branded theme to serve content to their Instagram Stories viewers. As a thank you to our dedicated readers, we’ve designed a pack of 20 customizable Instagram Stories templates that will instantly boost the look of your Stories. The templates are divided into five different themes, with four types of Story per theme. Choose the theme that best suits your purposes and customize it in Photoshop (instructions below) to match your brand—or simply use as is. The possibilities are endless! Here’s how to customize these templates for your brand and then upload them to your Instagram Stories. You will need Adobe Photoshop to get started. 1. After you’ve downloaded the templates, you’ll notice that the fonts and image files are separate. Double click on the font file of your selected theme to upload the font to your computer. 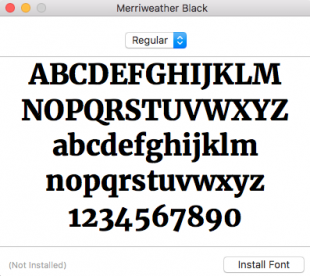 Click install font. 2. Double click the image file to open it in Photoshop. 3. Select the Story template that you’d like to work with first. 4. To edit text: double click the text you would like to edit. You can change fonts and colors in the menu on the left-hand side. 5. 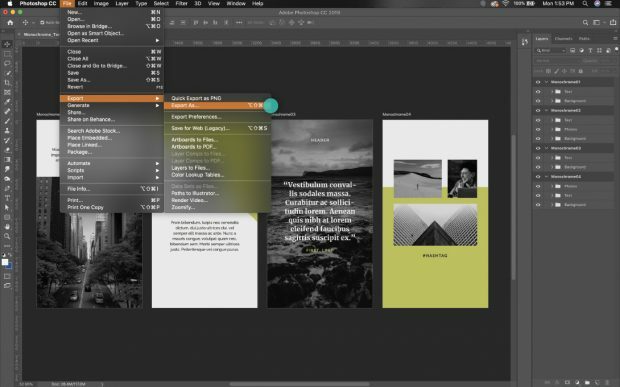 To edit a color block: double click the color block you would like to edit. Change the size or use the menu on the left-hand side to change the color. 6. To edit a photo: double click the photo you would like to edit and click insert new image. Resize image as necessary. 7. To save one single Story template: Select the Story you would like to save and go to Save>Export As>Artboard to Files. Make sure to save as a .jpg or .png. 8. To save all four Story templates: Save>Export As. Make sure to save as a .jpg or .png. 9. Email the finished image file(s) to yourself and download them onto your phone. 10. Upload to Instagram Stories one at a time. 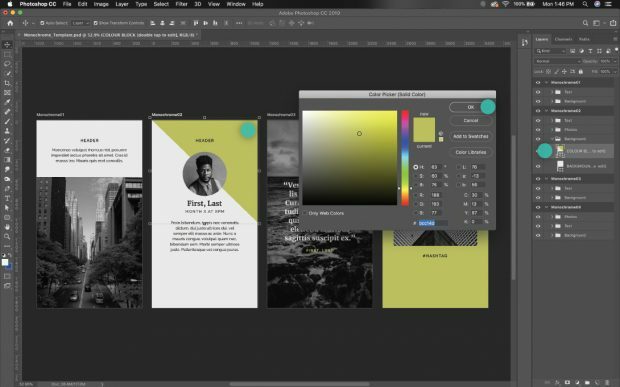 Use these apps to build Instagram Stories templates if you don’t have Photoshop, or if you don’t require a lot of customization capabilities. 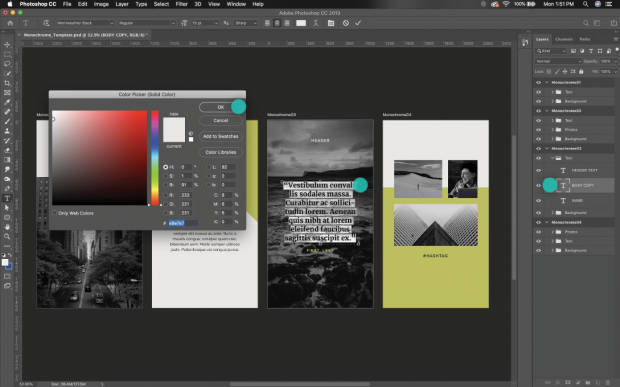 Adobe Spark: Create a free account with this graphic design app to create templates for any social media post, including Instagram Stories. Start with some of the basic templates they provide. 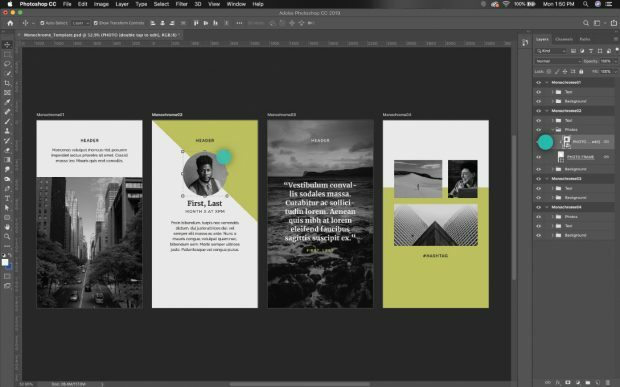 Canva: a free graphic design app for designing any type of social media post, including Instagram Stories. It’s easy-to-use and intuitive for non-professionals, which is why we include it in our list of resources for creating quick and beautiful social media images. Unfold: an app with ready-made Stories templates that you can download onto your phone. A Design Kit: Add brushes, fonts, designs, and stickers to your photos before you upload them to Instagram Stories. Save your settings for use on other photos later.